If you are a smartphone owner, you will agree that after maps, weather apps are among the most indispensable of smartphone apps. Once upon a time, people had to depend on forecasts on news channels and in newspapers to plan their day. Now, the whole process is just a click or a swipe away. 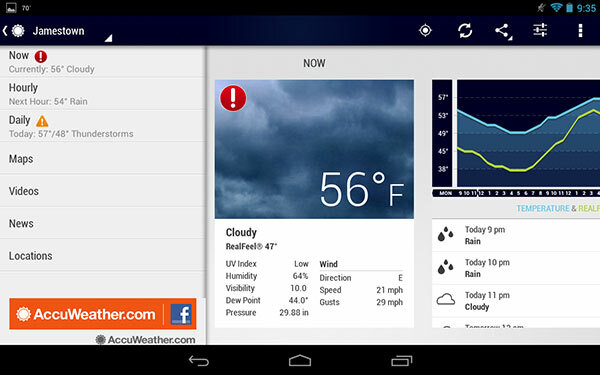 Here is a list of some of the most popular weather apps for Android smartphone. This is one of the best and beautifully designed, simple weather app. The interface displays images of your place you are in, along with the weather conditions and the time of day. You have the option to view detailed forecasts for five days at a time, and access interactive radar and heat and satellite maps. The iOS version won Apple’s 2013 Design Award, and the Android version lives up to the expectations. Although it is not a very detailed app, Yahoo! Weather has a clean and user-friendly concise presentation, which turns out to be its strength. This app is a relatively more detailed app. It provides you with a host of meteorological data, including temperature, visibility, and winds on a daily or hourly basis. An extended 10-day weather forecast is also available. The up-to-date Doppler radar data is displayed to predict rainfall and to alert you about severe weather events. You can also share images, videos and tweets on social networking sites. 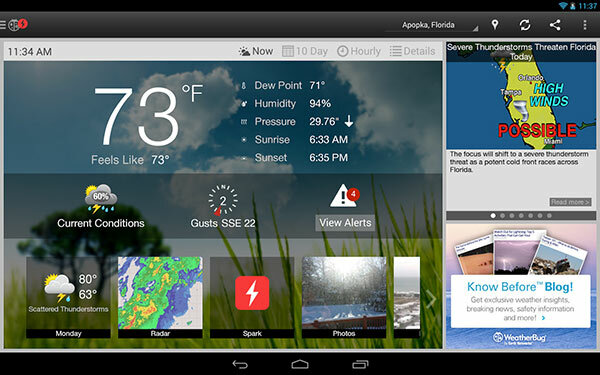 WeatherBug provides instant access to weather forecasts and alerts directly on your home screen. Improved interactive maps and images from a huge number of weather cameras across offer warnings and severe weather alerts. This app is a handy weather app with customizable widgets and many icons that you can toggle. So, you can practically customize the interface. It shows you current weather conditions, and offers weekly and 48-hour forecasts. AccuWeather for Android is one of my favorite and not only gives severe weather alerts, but also allows you to customize ‘My AccuWeather’ lifestyle forecasts according to health concerns. This includes certain categories such as Travel, Outdoor Fitness, Fishing and Game and so on. The app automatically updates current weather information (including wind speed, humidity and sunset and sunrise time) every 15 minutes. Wackett app scores high on the fun quotient. 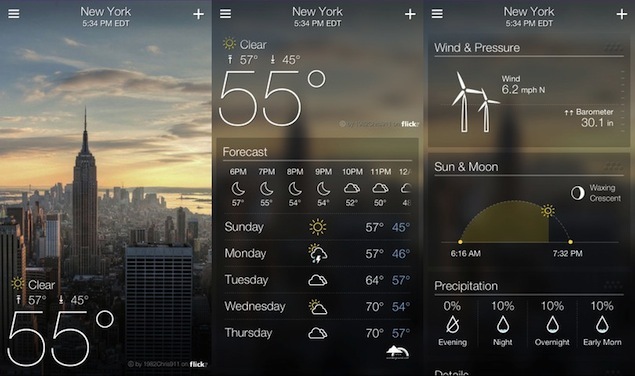 This quirky app gives you weather data, but presents it via infographics. “Peeps” are characters dressed in clothes that fit local weather conditions. For example, they wear coats and boots when snowfall is expected and shades and shorts on a hot day. Lifestyle forecasting is another interesting feature, which shows the effect of certain kinds of weather on regular activities. There is a host of other weather apps available. They are among the most basic accessories for a smartphone. When practically every task has been made easier by smartphone apps, why not weather forecasts? 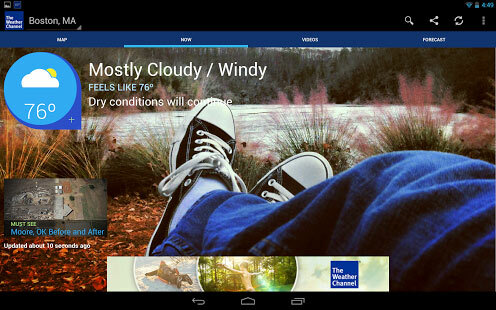 Go on, start making the best use of these Weather Apps for Android. After all, you never know when a hurricane may be around the corner!